The offering of ART COLOGNE 2015 (16-19 April) this year extends over three halls for the first time. Renowned galleries and art dealers present masterpieces of Modern and Postwar Art in hall 11.1. One can encounter the great names in Contemporary Art at the stands of international galleries in hall 11.2. In the upper hall 11.3, 29 young galleries in the NEW CONTEMPORARIES section encounter 32 participants of the COLLABORATIONS section introduced in 2014: the programme of the 49th edition of the 'International Art Market' promises the highest quality and an inspiring overview of current developments in art. New this year is the exclusive partnership with Artsy premiere resource for browsing over 40 of the world's most influential art fairs. 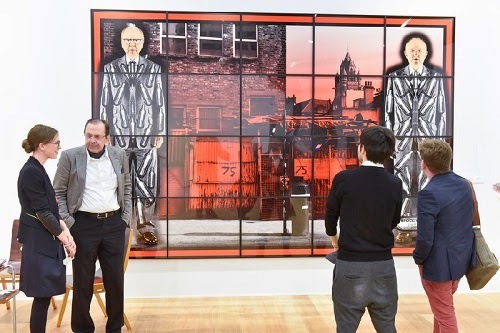 Collectors and art enthusiasts can explore ART COLOGNE on Artsy.net and the Artsy iPhone app. Artsy's online preview opens April 9th, where users may find information on exhibitors, artworks, and artists; inquire on works; and follow galleries and artists for future updates. During the fair, the Artsy microsite will be updated daily (see below for more information on Artsy). German blue chip artists are well represented at the fair. Concurrent to the 'Alibis' exhibition at the Museum Ludwig, works by Sigmar Polke will be presented at eleven galleries in the fair, including his primary gallery Michael Werner. Nine galleries are presenting works of Gerhard Richter, including galleries Löhrl, Ludorff and Schultz amongst others. Works by Georg Baselitz are being presented by eight exhibitors including Thaddaeus Ropac, recently deceased artists Günther Förg is being presented by six exhibitors. This year, many galleries are presenting noteworthy solo shows at ART COLOGNE: for example, 1301PE (Los Angeles) will be introducing the Danish artist group 'Superflex'. 401contemporary (Berlin) is showing a solo exhibition of the art band 'Chicks on Speed'. CANADA (New York) is presenting a solo show of the American artist Matt Connors. DUVE (Berlin) is presenting the works of German artist Jens Einhorn. Ellis King (Dublin) is dedicating its stand to the British-Iranian artist Kour Pour who has attracted attention with canvasses that are reminiscent of Persian rugs. Forsblom (Helsinki) is dedicating a part of its stand to the British Pop Artist Alan Jones. Ohwow (Los Angeles) is presenting a solo show of the Russian-born painter Kon Trubkovich. Nicolai Wallner (Copenhagen) is dedicating the focus of his stand to a solo show of the American artist Dan Graham who will erect a glass pavilion at the fair. The following galleries will focus their presentations on two artists: Contemporary Fine Arts (Berlin) is concentrating on the three-dimensional pictorial worlds of Peter Boehnisch and works by Borden Capalino, who composes his images from online advertisements. Espaivisor Gallery (Valencia), with the Serb Mladen Stlinovic and the Argentine Lea Lublin, is showing two artists who work with writing and statements. Themes and styles from various eras of art history meet in the painted collages of Amelie von Wulffen, who will be shown at the stand of the galleries Meyer Kainer (Vienna) and Gio Marconi (Milan) together with glass works by Kerstin Brätsch. Greene Exhibitions (Los Angeles) bring together Aaron Garber Maikovska and Marcus Herse in their presentation. Future Gallery (Berlin) unites two artists who are active in different disciplines with Spiros Hadidjanos and Jon Rafman. Eleni Koroneou Gallery (Athens) in turn addresses aspects of figurative painting with works by Helmut Middendorf and Tom Ellis. Several galleries of ART COLOGNE this year once again have artists in their portfolios who were recently or are currently represented in institutional exhibitions in the Rhineland: Parallel to the major retrospective in the Museum Ludwig, Michael Werner (Cologne/New York/Berlin) will show important works by Sigmar Polke. Mike Karstens (Münster) has dedicated his stand to the editions of Polke. Blain I Southern (Berlin/London) confronts photographic works of the director Wim Wenders, who can be seen in a retrospective in the Museum Kunstpalast in Düsseldorf as of 18 April, with bronzes by Lynn Chadwick. Simultaneously with the exhibitions in the Kölnischer Kunstverein and the Bundeskunsthalle Bonn, Chert (Berlin) presents the artist Petrit Halilaj, originally from Kosovo, who processes his personal experiences of loss in his installations. At Massimo de Carlo (Milan) is bringing works Andra Ursuta, who had a major solo exhibition in the Kölnischer Kunstverein in 2014. Markus Lüttgen (Cologne) brings together the painter Ryan McLaughlin, who had an exhibition in the Kölnischer Kunstverein at the start of the year, with the New York sculptor Matthew Ronay, whose sculptures of the most varied materials refer to organic natural shapes. Natalia Hug (Cologne) presents works of the sculptor and multi-media artist Corin Sworn from London, who recently had a solo exhibition in the Langen Foundation in Neuss. The newly designed hall 11.1 is characterised by a high class mixture of important positions of the 20th century: Klaus Benden gallery (Cologne), which specialises in Pop Art, presents a spectacular work by Andy Warhol with his 'Mona Lisa (four times)'. Ben Brown Fine Arts (London) is bringing two heavyweights with it to Cologne with the photographer Candida Höfer and the Zero artist Heinz Mack. BORZO (Amsterdam) places emphasis on Dutch artists of the 1960s, like Jan Schoonhoven or herman de vries, who is representing the Netherlands at the Biennale in Venice, as well as the recently deceased sculptor Carel Visser, one of the most important representatives of Dutch Constructivism. The Döbele gallery (Dresden) is focusing on Max Ackermann and the constructivist painter and sculptor Hermann Glöckner. The photography gallery Johannes Faber (Vienna) is bringing vintage photographs with it, among others, by Josef Sudek and Otto Steinert, as well as the famous movement study of Rudolf Koppitz from the year 1925. Fischer Kunsthandel (Berlin) shows works by Otto Dix, Georg Grosz and Karl Hubbuch. Well-known dealers of ethnographic tribal art are Dierking (Zurich) and Simonis (Düsseldorf). 'Frauenpower' (Woman power) is the theme of the gallery Haas (Zurich/Berlin), which addresses three generations of female artists, including Bridget Riley and Leiko Ikemura, who was awarded the Cologne Fine Art prize in November 2014. Highlights at the stand of the German Expressionism specialists Henze & Ketterer & Triebold (Bern) are three oil paintings by Ernst Ludwig Kirchner, including the 'Nächtliche Phantasielandschaft in Grün und Schwarz' (Nocturnal fantasy landscape in green and black). Koch gallery (Hannover) is bringing with it, among other things, classic Modern positions like Ernst Barlach, Lyonel Feininger, Ernst Ludwig Kirchner and Emil Nolde. Lahumière gallery (Paris) has created its stand according to the motto of 'black on white', at which, among other things, paintings and drawings by Victor Vasarely, Jean Dewasne, Charles Bezie, Claude Pasquer and Andreas Brandt will be shown. LEVY (Hamburg) will be showing, among other things, works by Richard Lindner and Daniel Spoerri. The pencil drawing 'Puppe' (Doll) by Otto Dix being offered by Ludorff gallery (Düsseldorf), originates from the collection of the Italian director Lucchino Visconti. A leader in abstract art after 1945, the Maulberger gallery (Munich), will present top works by Emil Schumacher, Fred Thieler, Ernst Wilhelm Nay and Fritz Winter. Moderne Silkeborg (Silkeborg) is showing artists of the Cobra movement, such as Asger Joern, Karel Appel or Pierre Alechinsky. Nothelfer (Berlin) presents German Informel art from the 1950s and Land Art by Christo and Jeanne-Claude. The gallery Remmerth und Barth (Düsseldorf) is focusing its stand on classic Modern art with works by Emil Nolde, Ernst Ludwig Kirchner, Erich Heckel, Christian Rohlfs, Otto Dix, Hannah Höch and Heinrich Hoerle. The focus of the Repetto Gallery (London) is on Land Art, including studies by Christo and Jeanne-Claude and a large work in stone by Richard Long. The Ruberl gallery (Vienna) directs attention to important Austrian artists of the 20th century like Oskar Kokoschka, Arnulf Rainer and Franz West. Thomas Salis (Salzburg) presents classic Modern artists like Max Ernst, Fernand Léger and Pablo Picasso together with the contemporary painting of Peter Dreher. The Expressionist Ernst-Ludwig Kirchner is the focus of Samuelis Baumgarte gallery (Bielefeld), which is represented with early woodcuts, lithography works, India ink drawings and oil paintings. Aurel Scheibler (Berlin) compares important positions of Postwar art like Norbert Kricke, Ernst Wilhelm Nay and Alice Neel with contemporary artists like the photographer Jack Pierson and the painter and drawer Tom Chamberlain. At Schlichtenmaier (Gräfenau) one will find important representatives of Postwar art like Willi Baumeister, K.O. Götz, Ernst Wilhelm Nay, Emil Schumacher and Fred Thieler. Highlights at the Setareh gallery (Düsseldorf) are Hans Hartung and Sigmar Polke. Sims Reed Gallery (London) is showing a selection of important prints and works on paper by key figures of postwar and contemporary art like Andy Warhol, Bridget Riley, Roy Lichtenstein, Gerhard Richter and Sol Lewitt. Walter Storms (Munich) focuses on important German positions like Günther Fruhtrunk, Ruprecht Geiger, Raimund Girke, Gotthard Graubner and Günther Uecker. Florian Sundheimer (Munich) shows works by Hermann Glöckner, Norbert Kricke, as well as of the French artist Jean-Charles Blais. Among the highlights at the stand of Galerie Thomas (Munich) is the large-format painting 'Olaf Wieghorst unterwegs im Schnee (Remix)' (Olaf Wieghorst underway in the snow) by Georg Baselitz. Tonelli gallery (Milan) concentrates on important representatives of Italian art of the 20th century with Fausto Melotti, Lucio Fontana and Agostino Bonalumi. For its stand, Edith Wahlandt (Stuttgart) has announced a large scale sculpture by Ernst Hermanns, who is one of the most important representatives of Concrete art. Valentien (Stuttgart), a returning exhibitor at the fair, is showing positions of Modern art, like Max Beckmann, Marcel Breuer, Wassily Kandinsky, Pablo Picasso, Hilla Rebay and Oskar Schlemmer. Axel Vervoordt (Wijnegem) is bringing familiar positions like Lucio Fontana, Gotthard Graubner and Heinz Mack with it, as well as the Ghanaian artist El Anatsui. von Vertes gallery (Zurich) is showing an extensive programme with Modern and Postwar art of Josef Albers, Willi Baumeister, Alexander Calder and Joan Miro, extending to Jean Dubuffet, Marino Marini, Serge Poliakoff and Pierre Soulages. Whitestone Gallery (Tokyo) is dedicating its focus to the paintings of the Gutai group, with artists like the renowned Japanese artist Kazuo Shiraga. Catherine Bastide (Brussels) and Parisa Kind (Frankfurt am Main) have a joint stand to present a group exhibition with Mike Bouchet, Sayre Gomez, William Pope L. and Kelley Walker. Cologne gallery Daniel Buchholz will, among other things, show a spray work on canvas by Michael Krebber, who will be awarded the Wolfgang Hahn Prize this year. Niels Borch Jensen Gallery (Berlin) offers, among other things, an untitled work by Martin Kippenberger from 1996. Gisela Capitain (Cologne) presents a brand new work of the American artist and filmmaker Sam Samore, as well as paintings by the British painter Gillian Carnegie. Capitain Petzel from Berlin are bringing works by the US-based artists Walead Beshty and Adam McEwen. Eigen + Art gallery (Leipzig/Berlin) confronts large format paintings by painting stars like Neo Rauch and David Schnell with sculptures by Birgit Brenner and Stella Hamberg. Konrad Fischer (Düsseldorf) is bringing, among other things, works by Bernd and Hilla Becher, Peter Buggenhout and Hans-Peter Feldmann, who will also create a guerilla performance during the fair. Paul Czerlitzki and Haim Steinbach are two artists from the ART COLOGNE programme of the Paris gallery Laurent Godin. Karsten Greve gallery (Cologne/Paris/St. Moritz) is showing, among other things, large format works by Cy Twombly and Louise Bourgeois. Hauser & Wirth (Zurich/London/New York) are showing a cross-section of different artists of the gallery, including a work by Ida Applebrogg from the 1980s, new portraits by Djordje Ozbolt, a group of sculptures and drawings by Phyllida Barlow, works by Martin Creed and Andy Hope, as well as a neon light work by Richard Jackson. Among the highlights at the stand of Kadel Willborn (Düsseldorf) are works from the estate of the Greek artist Vlassis Caniaris, whose object-like paintings and extensive installations document his sophisticated observation of reality. Kerlin (Dublin) offers, among others, the artists Willie Doherty, Siobhán Hapaska and Sean Scully. Editions by Christian Jankowski, Henrik Olesen and Lawrence Weiner are elements of the programme of Helga Maria Kolsterfelde (Berlin). Johann König (Berlin) is showing works by Annette Kelm, for whom the Kölnischer Kunstverein set up a solo exhibition in the past year. Krobath (Vienna/Berlin) presents elements of the gallery programme with Julian Opie and Otto Zitko. Gallery Gebr. Lehmann from Dresden is showing paintings and sculptures by Frank Nitsche, Martin Mannig and Tilman Hornig, among others. Florian Baudrexel and Ian Hamilton Finlay are part of the programme of Linn Lühn gallery (Düsseldorf). An eye-catcher at the stand of the Löhrl gallery (Mönchengladbach) is the brand new wood relief 'Giraffes' by Stefan Balkenohl. Here for the first time is the Javier Lopéz & Fer Francés gallery (Madrid) with works by Martin Creed through Alex Katz to David Salle. Marlborough Contemporary (London) is showing new works by Diango Hernández, Sigalit Landau and Koen van den Broek. This year's ART COLOGNE prizewinner, Hans Mayer (Düsseldorf), presents renowned artists of his gallery, like Robert Longo, Tony Oursler and Andy Warhol, as well as the young, South African shooting star Zander Blom. Vera Munro (Hamburg) confronts abstraction with figuration, established positions like John Armleder and Günter Förg with young artists like Eriks Apalais and Janis Avotins. nächst St. Stephan gallery in Vienna offers, among other things, works by Katharina Grosse, Imi Knoebel and Daniel Knorr. Dominik Sittig and Heimo Zobernig, who will represent Austria in this year's Venice biennale, are the focus of Nagel Draxler gallery (Cologne/Berlin). The highlight at the stand of NEU gallery (Berlin) is a brand new painting by Kai Althoff, the first in many years. Big names like Louise Bourgeois, Anish Kapoor or Martin Kippenberger can be found at the stand of Carolina Nitsch (New York). David Nolan (New York) offers, among other things, works by Richard Artschwager, Gavin Turk and German shooting star Jorinde Voigt. At Peres Projects (Berlin) one will encounter highly topical young painting positions, for example, that of the Cologne shooting star David Ostrowski. With Mario Merz, Pedro Cabrita Reis and Lawrence Weiner, one meets representatives of conceptual art at the stand of Giorgio Persano gallery (Turin). Thaddaeus Ropac (Paris/Salzburg) will present fresh works by Georg Baselitz and Imi Knoebel. Sprüth Magers from Berlin have, among others, the artist John Bock in its programme, who will celebrate a record release party on Saturday, 18 April in the Kölnischer Kunstverein. Other artists at the stand are Thea Djordjadze, Sterling Ruby and Rosemarie Trockel. Highlights at Elisabeth und Klaus Thoman (Vienna/Innsbruck) are the works of the Austrian artists Franz West, Heimo Zobernig and Herbert Brandl. Wentrup (Berlin) is bringing, among other things, current works by Florian Meisenberg, Olaf Metzel and David Renggli with it. Thomas Zander (Cologne) is showing, among other things, light installations of the light and space artist Robert Irwin. David Zwirner (New York/London) offers Neo Rauch's painting 'Die Skulpteurin' (The sculptress) from the year 2014, as well as works by Marcel Dzama and Stan Douglas. The Italian artist Erik Saglia and the American Ron Gorchov are two of the highlights at the stand of Thomas Brambilla (Bergamo). Three young artists provide the focus of Hezi Cohen gallery (Tel Aviv): the Essen artist Andreas Golinski, the American Matthew Chambers and the Israeli Nahum Tevet. Jan Kaps (Cologne) will present works by Peppi Bottrop and Tobias Hoffknecht. KLEMM'S (Berlin) is showing photographs, collages, sculptures and room installations by Gwenneth Boelens and Émilie Pitoiset. Steel sculptures of the Albanian artist Helidon Xhixha attract the eye at Gallery on the move (Tirana). With Josh Kolbo, Kaspar Mueller and Timur Si-qin, Société (Berlin) is presenting three artists who carry out artistic research in different media. Soy Capitán (Berlin) is showing, among other things, large format mixed media installations of the Hamburg artist Benja Sachau. The presentation of Kate Werble (New York) plans for four artists: Anna Betbeze, Ernesto Burgos, Lui Shtini and Molly Smith. A dialogue between the young American Addie Wagenknecht and the 15-year older Cologne sculptor Björn Schülke is being organised by bitforms Gallery (New York). The Hole (New York) and V1 (Copenhagen) are joining together to bring a curated exhibition with young Danish and American artists to Cologne. With Daniel Keller, Katja Novitskova und Slavs and Tartars, the Berlin galleries KOW and Kraupa-Tuskany Zeidler have artists in their programme that come to grips with modern methods of communication. Susanna Kulli (Zurich) and Ecart (Geneva) are showing works of the conceptual artist John Armleder and introduce the young Swiss artist Bertold Stallmach, who has become known for his animation films and installations. Cologne gallery Christian Lethert is sharing a stand with Callicoon Fine Arts from New York. Among others, Daniel Lergon and Rana Begum can be seen. Berlin galleries Daniel Marzona and Sommer + Kohl are organising an exhibition in which works by Bernd Lohaus, the deceased founder of the pioneering Wide White Space gallery, are combined with those of the Georgian artist Vajiko Chachkhiani. At their joint stand, Berthold Pott (Cologne) and Jeanrochdard (Paris) present the German painter Max Frintrop, who makes use of simple geometric shapes for his abstract compositions together with French painter Samuel François. Rawson Projects (New York) and the Estonia Contemporary Art Development Center (Tallinn) present two artists, Katrin Koskaru and Sam Martineau, who are dedicated to abstract painting. Thomas Rehbein gallery (Cologne) and Stalke Galleri (Kirke Saaby) are conveying retrospectively oriented insight into the grotesque, vulgar and scornful image cosmos of the painter and drawer William Anthony. Jacky Strenz (Frankfurt am Main) is attracting attention to itself with the most unusual coupling: it is showing a portfolio with drafts for frescoes produced by the German historical painter Wilhelm von Kaulbach (1805-1874), together with works of the young painter Max Brand. About Artsy: Artsy is the leading resource for learning about and collecting art from over 3,000 leading galleries, 425 museum and institutional partners, and over 50 select art fairs and auctions. Artsy provides free access via its website (Artsy.net) and iPhone app to 250,000 images of art and architecture by 40,000 artists, which includes the world's largest online database of contemporary art. Artsy's encyclopedic database spans historical works, such as the Rosetta Stone and the Colosseum, to modern and contemporary works by artists such as Pablo Picasso, Willem de Kooning, Richard Serra, Lucien Smith, Sarah Lucas, and Cindy Sherman. Powered by The Art Genome Project, a classification system that maps the connections between artists and artworks, Artsy fosters new generations of art lovers, museum-goers, patrons, and collectors.